60 straw bales were delivered to our farm the other week. They will be used to mulch our vegetables next year. This summer’s drought again reminded us of the importance of keeping the soil covered to preserve moisture. 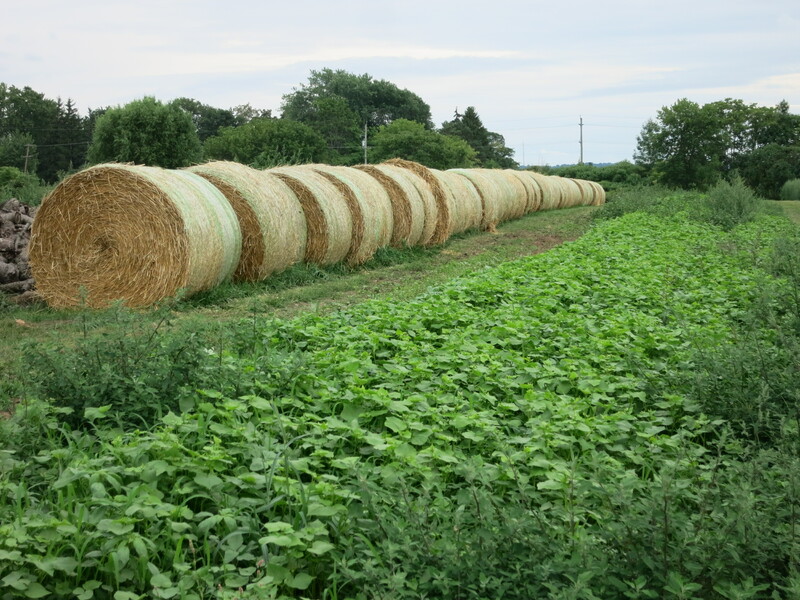 In front of the bales is a small patch of buckwheat. Buckwheat grows quickly to cover the soil & keep down weeds. It has a lot of fine roots which loosen the soil & improve it. We seeded the buckwheat earlier in the season expecting to let it grow briefly before working it down & planting vegetables. 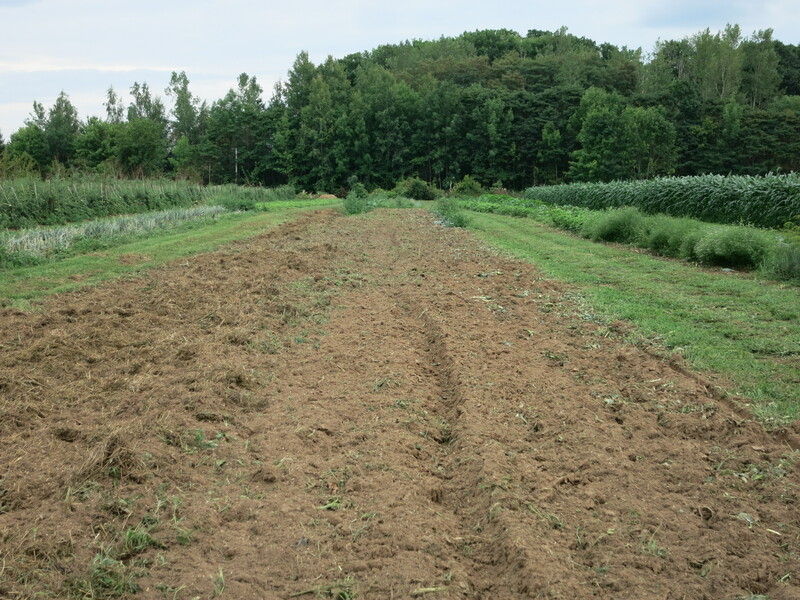 But the drought wouldn’t allow us to grow as many vegetables as planned so we let the buckwheat continue. It’s slower than usual without the needed rains, but if we allow it to keep growing, it will flower & attract lots of beneficial insects & pollinators. Either way it is a benefit to the farm. Today I mowed down some vegetables that were finished. The rains we had on the weekend – 3/4″ of very welcome moisture! – allowed me to work the ground & seed more cover crop. Oats this time, mostly because that’s what I had lying around. It should grow quickly & prevent weeds from coming. As oats can take cold weather, we will probably let it continue to grow until the winter kills it. Next spring we’ll work the soil & plant crops again. 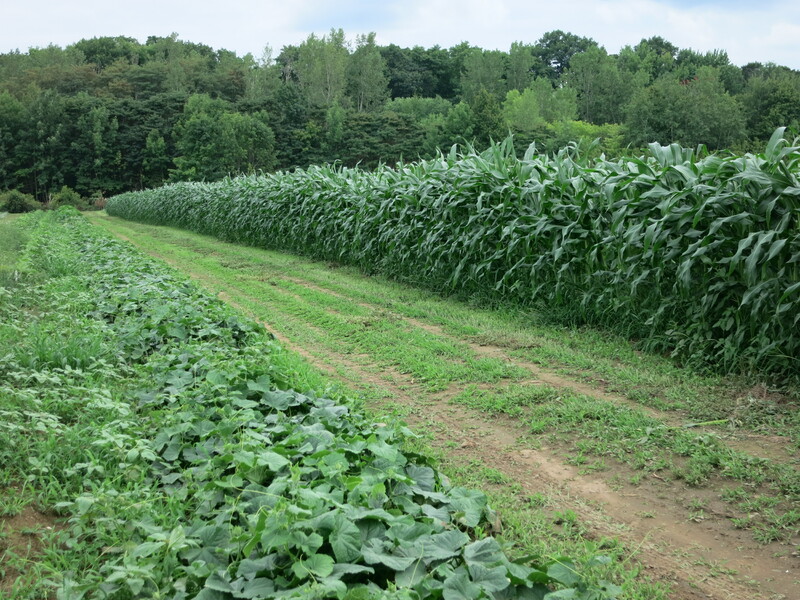 It’s always best to have the soil covered for the winter to prevent erosion, catch the snow & keep the moisture. Sometimes it’s hard to think of next year when we’re busy with this season’s harvest. But it’s a necessary preparation that will pay off later. As usual it was a busy Monday – a day of harvesting. If the weather reports turn out to be accurate, tomorrow should be a day of precipitation. In anticipation of this, we worked ahead to pick what we could. If it doesn’t rain … we can catch up on other chores. Blackberries, tomatoes, zucchini, onions, garlic, beets. If this week’s box looks familiar – it is. Blame the drought! Throughout the summer we have been buying truckloads of water to keep the tomatoes & blackberries going as these are our 2 most important crops. Most other vegetables were watered as necessary to get them started and then were left on their own. We have learned what can survive without water & what can’t. 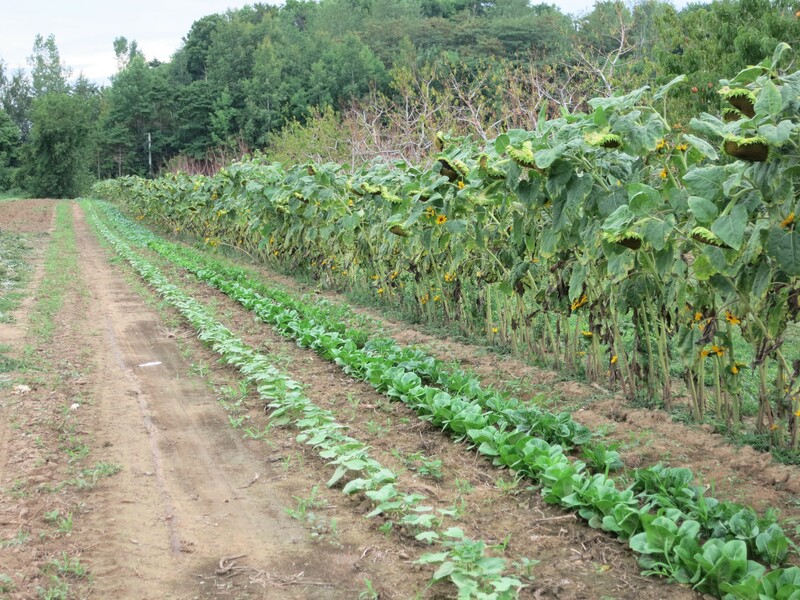 We are now more than half way through our CSA season. Thank you for your continued support & encouragement. Thank you. The bales present quite a picture !!! The green is so beautifully green. Yes, praise be for the rains.